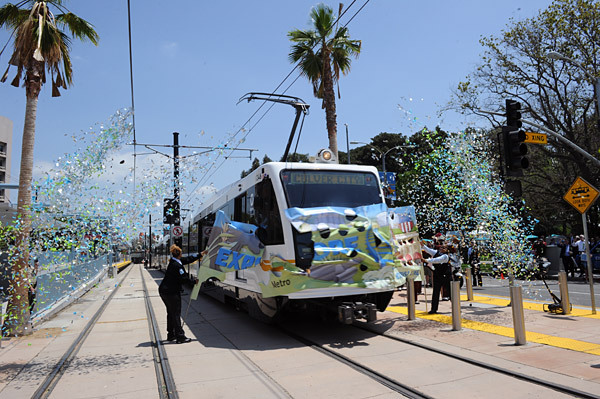 As seen in the latest edition of Supervisor Zev Yaroslavsky’s Weekly Web Flash: They were the first operators to board the new Expo Line for the testing runs. On opening day, Operator Carolyn Kelly was behind the controls in the cab of the inaugural train that broke through the banner at the Expo Park/USC Station. Operator Sheila Celestain was holding the banner, train right. A few days later, the top performers scored first and second at Metro’s Rail Rodeo, a local competition that showcases rail operating skills and also determines the team who will represent Metro at the International Rail Rodeo put on by the American Public Transportation Association. This weekend, the operator team, along with top-scoring maintenance technicians Charley Houck, Blue Line Fleet Services, and Jose Padilla and Alan Addie, both of Green Line Fleet Services, are in Dallas for the Internationals, taking on rail teams from across the nation and Canada. Go Metro! Operator Carolyn Kelly is at the controls of the inaugural train at the opening of the Expo Line. Operator Sheila Celestain, at left, is holding the banner. Barely visible, holding banner at right, is the third original Expo Line operator, Narvolean Jackson. Really? A rail rodeo? What are they going to do, see how well they can parallel park a Dallas rail train? Give me a break. How much is this costing? Just as in any other organization, employee spirit and pride is essential. If operators take pride in their skills operating trains and buses, there will be less accidents and less breakdowns. And since they have professional pride in their job, better rapport with riders – who will sense this professionalism and respect them. How much is it costing the taxpayers to fund this? I think employee morale is very important but need more buses and maybe even a raise for those poor guys who have to put up with so much crap from some of the riders. Since Metro makes no profit, more buses and raises means more out of your paycheck. Or, some of the well paid Metro officials can take a pay cut. Strange that never seems to be an option to close the budget gap, eh? Well Jeff, Just so you know that Metro does more than just consider pay cuts, which logistically is just hard to do, but 2 years ago the Agency lost over 300 employees to “close the budget gap”. In addition no one EXCEPT UNION WORKERS has received a pay raise in over 3 years.